As Small Businesses use the Open Enrollment Period (OEP) to reassess the health benefits question, it is important for them to understand all of their options, in order to optimize the balance between accessibility and affordability. A new eBook distributed by Zane Benefits aims to help small businesses successfully navigate the new health insurance landscape. As Small Businesses use the Open Enrollment Period (OEP) to reassess the health benefits question, it is important for them to understand all of their options, in order to optimize the balance between accessibility and affordability. 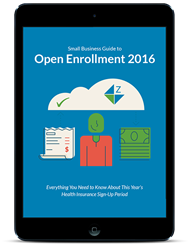 Zane Benefits has been leading the effort to level the health insurance playing field for small businesses since 2006, and recently published an eBook titled Small Business Guide to Open Enrollment 2016. This solution-focused guide helps small business owners explore the option of using a health reimbursement plan (HRP) to supplement individual health insurance for their employees—as an alternative to traditional group insurance. In addition to providing an arguably better alternative for small businesses already offering health benefits to their employees, the guide provides a valuable resource to the millions of small businesses who do not currently provide health benefits of any kind. Readers of the eBook will find practical help with navigating the 2016 open enrollment period and useful tips for using individual health insurance to offer healthier employee health benefits. Zane Benefits' software helps small businesses reimburse employees for individual health insurance plans for annual savings of 20 to 60 percent compared with traditional employer-provided health insurance. Zane Benefits' software has been featured on the front-page of The Wall Street Journal, USA Today, and The New York Times. Learn more at http://www.ZaneBenefits.com.